I have just dicovered that my great grandfather Michael Brett served in the Royal Engineers. I have been searching for years for information about who he served with to no avail. I knew he served during WW1 as at his inquest in 1940, it states that he 'served in the Great War' and had been in hospital 'suffering from the effects of wounds in the last war.' I had been unsuccesful in finding any records for him until recently when I took out a trial with Fold3 and his pension and medal roll records showed up. However, it appears that no other records have survived. The records show that he served in The Royal Engineers as a Sapper - Regimental Number 458094 but it doesn't state which unit. He was discharged on 30th March 1919. Is there any way of finding out from his service number which unit he served in and where he was posted? He was a stonemason by trade so I would imagine that he would have been doing something along those lines. He was born in 1877 in Batley Yorkshire but the pension record stated 1879 so I think he knocked a couple of years off his age when he enlisted. He lived in Sunderland. His medal roll record only shows his new renumber, so he probably didn't serve in an active theatre of war before 1917. After being renumbered it is also at least possible that he served (in full or part) with another unit, as illustrated by the CWGC death records for RE men with surrounding near numbers that were issued from the same renumber block. We have been in contact elsewhere and I am delighted to see that, as I'd hoped, a real expert has been able to take your search just a bit further. At the very least you now know, thanks to clk, that GGrandfather served in a Field Company. However, as you see from the death records examples, whether he stayed with one or other of the Northumbrian Field Companies is uncertain. Clk, thank you from me for furthering this lady's research and for reminding me not to overlook the TF re-numbering next time. Chris is quite correct. I had a quick look in the Medal Rolls but the only Service Record I found at first glance was for 458118 Fred Latham. He was from Clitheroe in Lancashire and enlisted at Preston. According to his papers he was initially posted to (what looks like) 454 Northumbrian Reserve Field Company. He served in France from 01/04/1917 to 20/10/1917. He joined 84 Field Company (20 Division) on 25/06/1917 from No 9 R Co (No 9 Reinforcement Company RE). 459138 Spr Allen, A J (mason) from No 2 Reinf Co 13/08/1917. 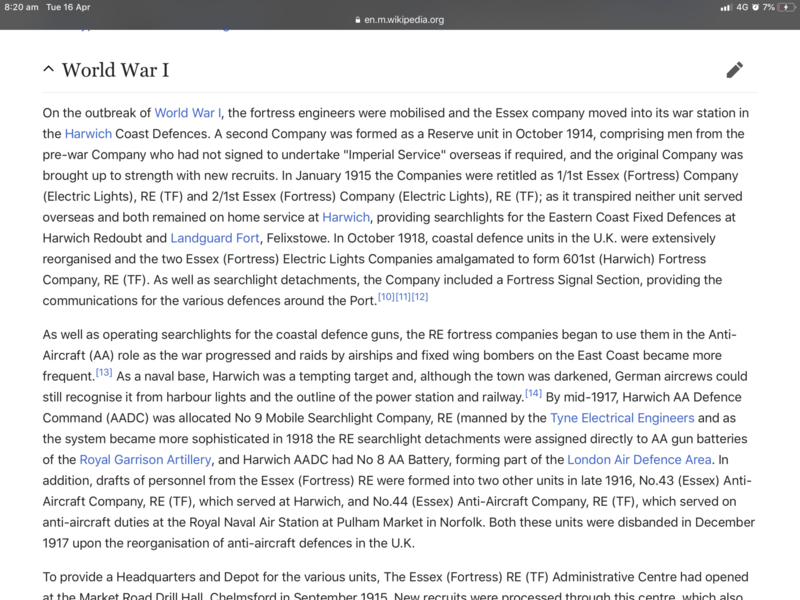 Having said that I did notice some 457xxx numbers in the 1917 WD of 446 FC and some 459xxx numbers in the WD of 447 FC. Many thanks to clk and Max for helping me with this. Max advised me to come to this forum as he was sure that there would be someone with expertise to assist. He was absolutely right. I now feel that I know a little bit more and have something concrete to go on. The 446 Field Company War Diary is available to view on Ancestry but the diary ends on 7th October 1916 and it appears that my great grandfather didn't actively serve until 1917. I am enormously grateful to both of you. A million thanks. Sorry Brian. I didn't see your response when I posted my reply. It just seemed to 'appear' afterwards. I will look further into the war diaries. Thank you so much for taking the trouble to respond. 458118 Fred Latham... According to his papers he was initially posted to (what looks like) 454 Northumbrian Reserve Field Company. I might well be wrong, but I'm wondering if Michael served in the UK with the 454 FC RE before being posted overseas to an 'active' unit. I also saw some papers for 458108 Harrison. 458127 McCarthy, and 458136 Rogers. Given that within a particular TF unit the new 6 digit renumber was usually issued sequentially based on their previous unit number their records may allow some inferences to be made. The overall 'flavour' I got is that they appear to have joined/been called up in late September 1916, received some 'trade' training at the RE Depot, before being posted to the Northumbrian RE. That would kind of fit with the calculated enlistment dates of (based on their War Gratuity payments shown in their Soldiers' Effects records) of 458106 Hunter and 458120 McDonald of circa October 1916. From the pension record that you posted, it doesn't mention physical wounds. It refers to heart problems...'DAH' - see the LLT here, the links will give you more detail about the condition. For physical wounds you may be able to pick him up on a casualty list. Unfortunately, I don't currently have access to them. The LLT gives advice on how to try to research a soldier here. There's an RE casualty lists thread here on the GWF, which must be searchable - worth a try I'd think. The 446 Field Company War Diary is available to view on Ancestry but the diary ends on 7th October 1916 and it appears that my great grandfather didn't actively serve until 1917. It is all there up to Jun 1919, I'll contact you direct. He does not appear on any of the RE casualty lists that I have posted and there is no record of his number with a MH 106 hospital admission on FMP. 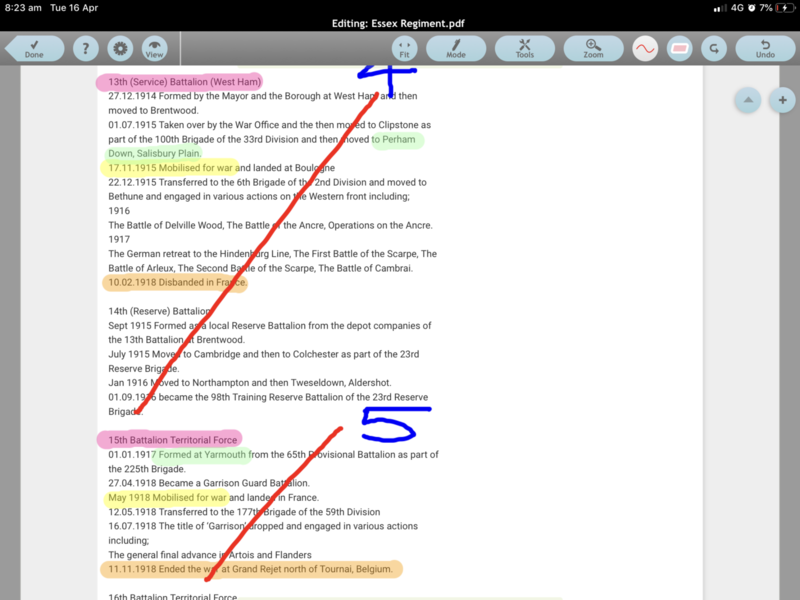 I am currently going through all the RE casualty lists that I have posted (and RE wounded in the Times OCLs) to check names and numbers for accuracy. 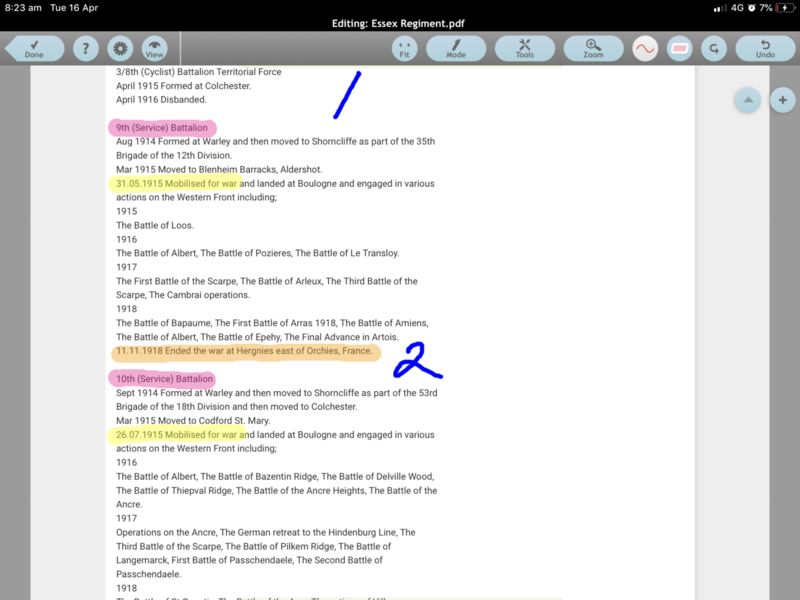 There are many casualty lists that were too faint to post but I am indexing the names on those as well. I always check when I see any RE thread. I have just joined the forum and the first post I found was this one related to RE, which is specifically my interest and I have a similar query as Genie24. 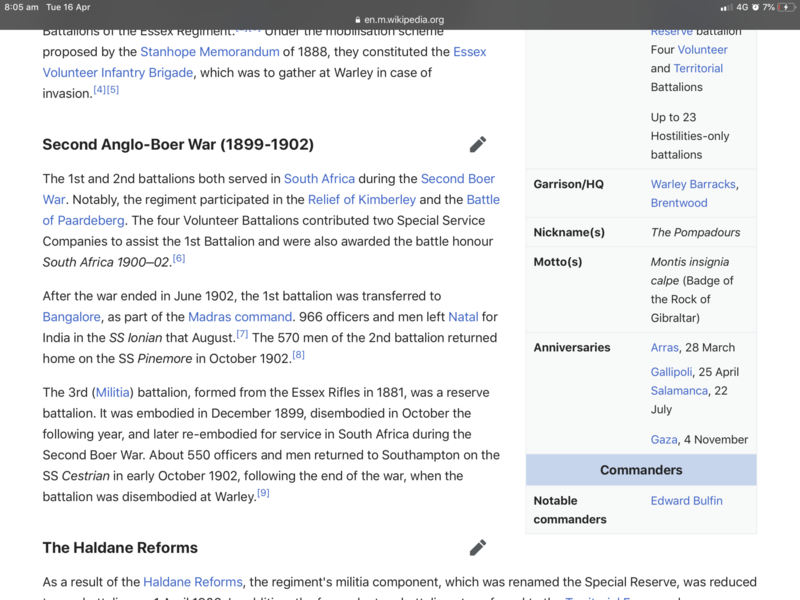 I have read the thread and followed the use of some of the links and I noted that on LongLongTrail the renumbering issue may not be applicable to my GGrandfather, as indicated on the site. I had always thought he only served in the TFof the RE and didn't see field action. 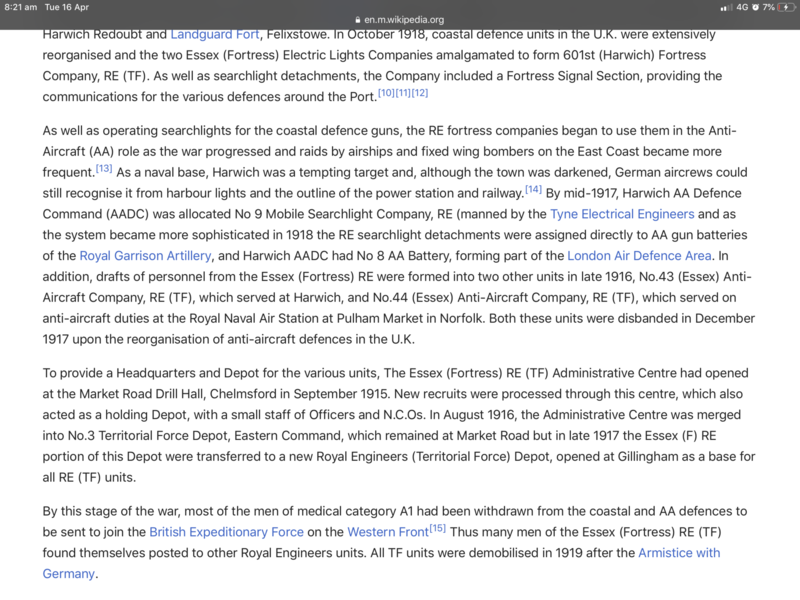 An investigation of the regiment (Essex) I learnt that a number of them were deployed to the British Expeditionary Force (B.E.F.) on the Western Front. On closer review of some of the records I have of his time with the Regiment, I noted that he spent some 18 months in the B.E.F. But I don't know which unit he was with, to be able to follow where he served on the western front and which if any campaigns he contribute to. He was a member of a railway operating company. His WR pre-fixed number was issued sometime after March 1918 when all men belonging to RE transportation units had a number change. Units were instructed to forward nominal roles of their men for this renumbering. If you can find men of with similar nearby numbers who have service records, it might be possible to track his unit down. These units were around 300 strong. These new numbers however did not actually start to be issue until around June 1918 so there is a chance that a man might have been posted in the interim which could confuse matters. Many thanks - should have realised you'd already be checking this! You do a great job for those of us who have RE research going on, much appreciated. I notice Sapper Newcombe enlisted at Bangalore in June 1916, so I presume his initial service was with the Essex Regt prior to joining RE in 1918? According to LLT there was a 2nd Garrison Battalion of the Essex Regt stationed in India. Not sure how this tallies with his service recorded as being "Home/BEF/Home". His enlistment date is broadly (though not precisely?) what might be expected for a married man of his age under the Derby Scheme, again according to LLT. Be interested in your findings, do let us know. thx for you response. To clarify something for both TR and yourself. My GGF first enlisted with Essex Regiment in mid 1890s and served in second Boar war. 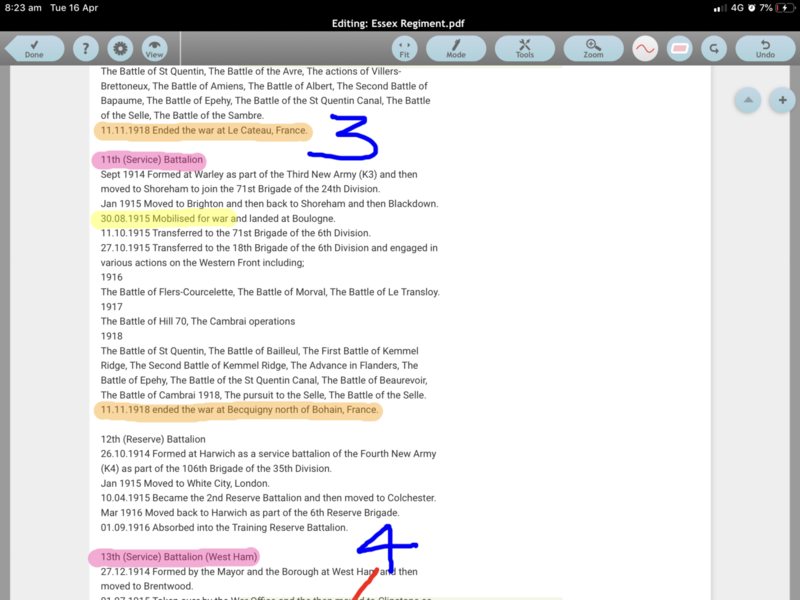 My research suggest it was with the 1st Battalion. This Battalion was transferred to Bangalore in June 1902, post the end of the second Boar War. He remained enlisted there and may also have been in a reverse capacity once he left the army in about mid 1900s. He re-enlisted in June of 1916 for WW1, was tranpsported from Bangalore to the UK in late 1916, where he was transferred to the R.E. The Home/BEF/Home refer specifically to WW1 service only. so was wondering if he may have been one of these highlighted below? Thank you again to both of you for your experienced assistance in this area. Any further direction would be again very much appreciated. Aha - thanks for the clarification (and, what an interesting life he must have led) Willo. I have been following up all of the above posts in response to me query. Thanks again to all. Although it cannot be 100% certain, it does seem extremely likely that my great grandfather Michael Brett served with the 446th Field Company evidenced by the renumbering system and allocation of numbers. It also seems extremely likely that he enlisted or was called up at the end of September 1918. With this in mind, I have been looking at the War Diary and in particular the entries from 1st October 1918 until the 30th March 1919 which is the date he was discharged which is just a 5 month period. I have began to make a transcription which is thankfully proving to be quite easy. It appears that all manner of work was carried out as they moved around quite frequently doing anything that was required en route. Repairs, demolition of dams etc and building of bridges. As this is the only evidence I have, I am assuming that my great grandfather participated in this work and now I have a record of the sequence of events and where they were on a particular date. My Dad and his youngest brother, who are the only surving grandsons of Michael will be very interested in this information. On his Pension Record, I think the reason for discharge reads 'Debility' but I had no idea what 'Dah' meant until now. I hadn't researched it but now see that it means 'Disability of the 'Heart' or 'Soldier's Heart' and some sources say it is an old term for 'Post Traumatic Stress Disorder.' Either way, it states that his condition was due to his service and I am now wondering if he was suffering from Post Traumatic Stress Disorder, this may have been the reason he was in hospital and so can assume he had suffered from his discharge until his death 21 years later. I am going to see if I can find out more about the men with regimental numbers close to him to see if I can find any more clues but for now I am very happy with what I have learned over the last few days. I accept that I may never know if he served prior to this but will keep in mind the possibility of him being in the 454th Northumbrian Reserve Field Company. I had a quick look on CWGC but couldn't find 458020 Gorefunkle who died in the UK. I am extremely grateful for all of you who have taken the trouble to respond to my initial query and value your expertise in these matters. Thanks Brian for that advice. I do have a contact who spends a lot of time in the Sunderland Library Local History section indexing the burial records. He has found a lot of burial records for me over the years. We first got in contact a few years ago when he responded to a Rootschat post of mine. He had found a newspaper article of an inquest for my great x 2 grandfather who died in the workhouse. I will maybe ask him if he can find anything.